I have never read a book like this and it is not one that I would normally reach for at a bookstore. I heard about Myke Cole when Gail Carriger mentioned a few twitter accounts she enjoyed and I ended up following his. This was right around the time that this book came out so there was a lot of promotion for it and it kept popping up in my feed. I was seriously shocked over how much I loved the military aspect in the very beginning of the book, and it actually took me a while to pick it up again after the magic part started. 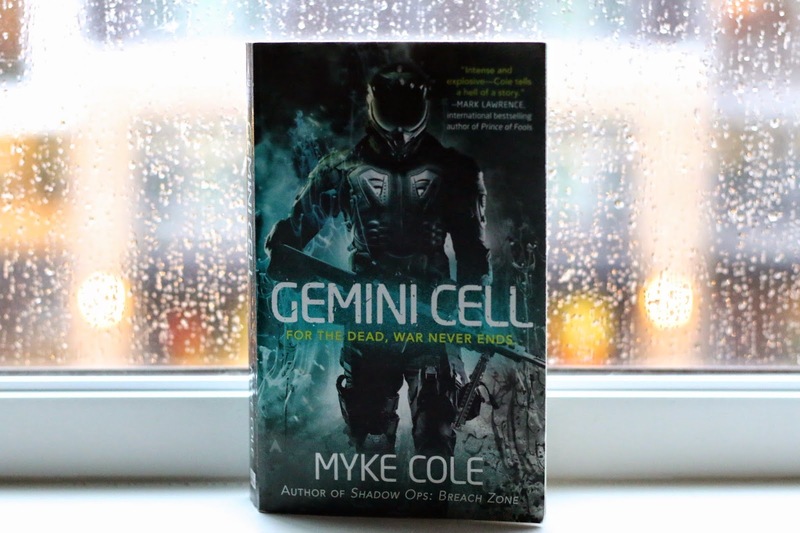 Gemini Cell is about Jim Schweitzer, a Navy SEAL, his wife, Sarah, and their son, Patrick. After a particularly risky mission, the targets of said mission somehow get Jim’s identity and attack him and his family in their home. Everyone ends up getting shot and the gist of it is that Jim is really shot and killed but brought back to life through the Gemini Cell (a super secret military program), while Sarah and Patrick are taken to the hospital and make full recoveries. Jim is told that his wife and child had died and Sarah is told that Jim died. While their “lives” continue on, neither of them can shake the feeling that the other is still out there. In the Gemini Cell program, Jim is brought back into a seriously modified, Frankenstein’s-lab version of his body. He is a weapon, virtually indestructible, and shares his new weapon-body with another soul; one that has been dead for thousands of years and believes himself a god. Jim is taken on quite a ride to get back to his humanity and the person he fully was before, mostly due to lies from the government. I haven’t read any other type of military book so I don’t know if there are any more out there like it (besides his other books), but I was totally blown away at how unique the concept for this story is. I wish I had finished it before I met Myke at ECCC to properly thank/gush in person for an awesome read.